Funny, I tried to post and it disappeared. So, a few items again: Slippy straps really need careful adjustments, and readjustments when you change the way you wear your bra. For example, back bulge can be minimized by tugging the band up higher in the back. There are clips which you can get in various stores (I think even JOANN’s) which hold the straps closer together in back (GGs have the same problems). I have some front-closure bras I really like ( I call them “jacket bras” from the way one puts them on). Another trick for a wide chest is to cut the band in front, and sew in a gusset to expand it. I sometimes use a shotgun approach by getting some bras at a Goodwill bin store, for pennies each, and those that don’t work out, just get donated back. If you keep trying, you will make it! Excellent tips, Joan! Thank you! Oops, one more thing: I don’t really like padded bras; they usually look and feel funny. Ah-h-h, but in winter, a wee bit of foam adds nice warmth, and with loose or thick clothing, it looks ok. 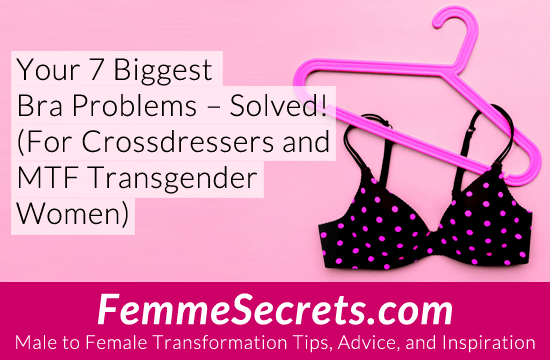 I simply want bigger breasts, in which after 3 years, I have failed miserably!